Morocco’s main independent human rights group demanded a judicial investigation into what it said were serious violations that affected the outcome of a July 1 referendum on constitutional reforms. King Mohammed is expected to hand over some of his powers to elected officials under the new charter while retaining a key say over strategic decisions. The government said nearly 100 percent of those who voted in the referendum approved the changes. Khadija Ryadi, who heads the Moroccan Human Rights Association (AMDH), said that in the absence of international observers, the vote “witnessed serious violations … throughout the referendum process”. “We have material evidence those violations … did impact the credibility and the validity of the results that were announced,” Ryadi said at a press conference presenting AMDH’s report for 2010 and the first half of 2011. Authorities used mosque preachers and religious schools and monasteries to urge worshippers to vote in favour of the reform crafted by the palace in what Ryadi called a “horrible exploitation” of religion. The authorities also allowed campaigners in favour of the reform to deploy in cities on voting day while the campaign was supposed to end the day before, she said. Authorities used the state machinery, public media and official premises to campaign for a “Yes” vote, in what Ryadi said was “blatant discrimination based on political opinion and an illegal use of public assets”. Policemen were present at some voting stations while others had only ‘Yes’ voting slips, she added. “We demand a judicial probe … This will be the first test for the constitutional court under the new constitution”. The interior ministry, which runs elections and domestic security issues, said 98.5 percent of those who voted approved the text on turnout officials estimated at 73 percent of registered voters. Opponents have said that more than half of Moroccans actually eligible to vote did not do so at the referendum, either because they were boycotting the event or because of lack of interest. 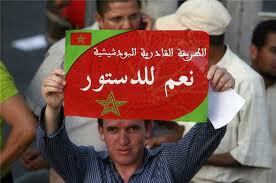 Morocco had at least 75 political prisoners at the end of 2010, Ryadi said. There were also 342 people who are being prosecuted without being jailed. Morocco released 92 political prisoners in April under a pardon issued by King Mohammed after street protests demanding democratic reform by the youth-led February 20 Movement. Inspired by uprisings which ousted leaders in Tunisia and Egypt, the February 20 opposition movement has been holding regular protests for months to demand a parliamentary monarchy and that officials they accuse of graft be brought to justice. The AMDH report said two human right activists and ten activists from February 20 were sentenced in June to up to three years each in jail after protests in the eastern town of Bouarfa in May on grounds they encouraged armed gatherings and attacks against civil servants.